Industrial transformers come in various sizes, capacities and functionalities (just to name a few). For operators, one must select a transformer that meets the needs and requirements of the project or business. This article compares the following types of transformers and their applications: isolation transformer, auto transformer, DOE 2010/2016 transformer and buck-boost transformer. 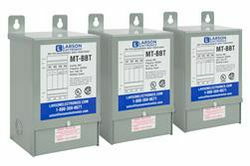 Industrial transformers come in various sizes, capacities and functionalities (just to name a few). For operators, one must select a transformer that meets the needs and requirements of the project or business. This article compares the following types of transformers and their applications: isolation transformer, auto transformer, DOE 2010/2016 transformer and buck-boost transformer. An isolation transformer is a basic, two-winding unit with separate primary and secondary coil windings. As the term suggests, a main isolation component separates the two windings. In application, an operator connects line-in power on the primary side of the transformer, with the unit providing isolated output of the alternating current on the secondary side. This type of transformer is mainly used for electrical isolation. Because of this, electrostatic shields and other protective components are commonly used with the unit, in order to deter noise. “Isolation” occurs in isolation transformers, because an electrical connection is not shared/does not exist between inputs and outputs. When used strictly for isolation, an isolation transformer may feature a 1:1 (equal) turns ratio, suggesting no voltage conversion will take place. The turns ratio in the primary and secondary windings are not equal when a transformer is required to step up or step down input voltage (more on this later). When to use: prevent ground loops, accurate measurement requirements, equipment preservation (isolation), electrical safety, sensitive equipment, mitigate electrical disruptions, transfer power between two non-connected circuits and more. Next, an auto transformer is a unit with a common primary and secondary winding. Due to the transformer’s shared, single-winding configuration, isolation does not occur between inputs and outputs. Furthermore, the common coil in transformer is responsible for the functionality of both primary and secondary windings. For voltage conversion, the winding component in an autotransformer can be tapped accordingly, at various points on the winding. As mentioned earlier, when stepping up or stepping down input voltages, conversion is dictated by the turns ratio (also known as transformer ratio). To arrive at the turns ratio of an autotransformer, one must divide the turns on the primary side with the secondary side. For example, if 240V is provided on the primary and 120V is required on the secondary, the required number of loops on the primary side is 2x (double), compared to the secondary side, resulting in a 1:2 ratio. From a cost perspective, auto transformers are economical; in a sense that the unit’s shared configuration allows it to use less materials. Additionally, this type of transformer is more compact than an isolation transformer. Businesses with strict space-saving requirements at the work site may find this feature advantageous. When to use: voltage conversion, current regulation, non-isolating electrical connections and more. Drive isolation transformers are used with AC/DC variable motor drives. Isolation is provided for the input current and SCR load, as the primary windings and the secondary windings are separate. In application, an operator may utilize a drive isolation transformer to reduce load issues inflicted by the SCR drive component. When to use: SCR drives, variable speed drives, motors, reduce mechanical stress, decrease noise/electrical distortions, voltage conversion and more. The US Department of Energy (DOE) governs efficiency and performance standards of industrial transformers under the Energy Policy and Conservation Act of 1975 (EPCA) and 10 CFR Part 431 Energy Conservation Program: Energy Conservation Standards for Distribution Transformers; Final Rule. DOE 2016 standards officially superseded DOE 2010 standards on January 1, 2016. Hence, most of the focus will be on DOE 2016 transformers. There are several meticulous details in the standards that must be carefully taken into consideration. For instance, the scope of the term “distribution transformer” does not refer to an autotransformer, rectifying transformer, units with 20%+ tapping range, welding transformer, drive isolation transformer and more. Instead, the scope of DOE 2016 transformers includes the following: liquid-filled/immersed, low voltage dry-type and medium voltage dry-type. Based on current DOE 2016 regulatory guidelines, this type of transformer features an input voltage of 34.5kV (or less), output voltage of 600V (or less) and a frequency rating of 60 Hz. Moreover, the scope of application is limited to distribution transformers with capacities not exceeding 2,500 KVA for both liquid and dry-type units. When to use: DOE compliance, industrial regulation compliance, energy savings and more. Lastly, a buck-boost transformer is a type of autotransformer (according to 2008 NEC Handbook Section 210.9) that steps up (boost) or steps down (buck) an input voltage in an economical manner. Equipped with two primary windings and two secondary windings, this type of transformer is applicable to small voltage conversion requirements, roughly between 7 and 20 percent. Buck-boost transformers are versatile, depending on their connections. When functioning as an autotransformer, it is common practice to use 2-3 buck-boost transformers for handling three-phase voltage rectification, while one unit can be used for single-phase voltage conversion. In an isolated configuration, operators can use the unit as an isolation transformer, which converts line-in power to a desired low voltage setting (12, 16, 24, 32 or 48V). When to use: field connections, space-saving configurations, minimal voltage conversion, motors, lights and more.